“We have adopted the 3-2-1 feedback method as a quick win in teaching employees good feedback methods and habits. The results have been impressive.” Skip Franzsen. Bytes Human Capital and Transformation Executive. 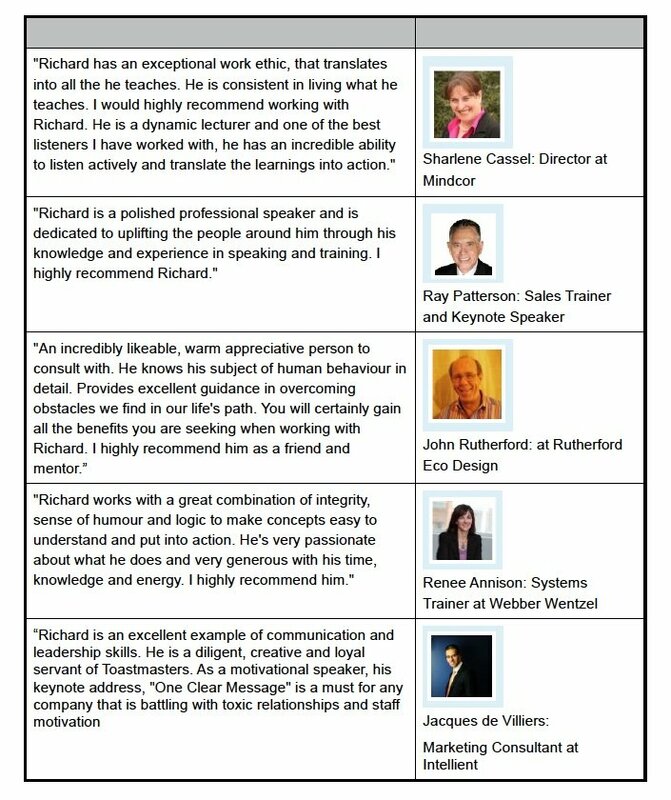 “Richard has assisted our team with customised presentation skills and presentation design training. With his expertise he brought about a fresh new approach and way of thinking which has assisted us to improve our level of presentation skills. We will continue to make us of Richards services within our organisation.” G. Figueira, Area Sales Manager at Amadeus GTD. “I worked with Richard in the context of Toastmasters where he supported the elected leadership of Toastmasters Southern Africa in designing a PowerPoint presentation for our bi-annual business meeting. Richard is passionate about ensuring that PowerPoint enhances your message. He made the PowerPoint presentation interesting, crisp and effective. He also coached all the members of the Committee that were presenting on how to effectively utilise presentation tools like ‘presentation view’ and a clicker to wirelessly move on to the next slide. He is detail focused and creative. I have had numerous meeting attendees comment on how effective the meeting was – and the presentation was a key part in this success.” F. Fraser, District Governor Toastmasters, District 74, Southern Africa.